Interview with Kode9, via e-mail, late September 2006. Where and when have you and Spaceape met each other and eventually decided to work together? We met in 2009 in South London via a mutual friend. Our first track together ‚Sine of the Dub‘ was an accident. Spaceape dug out one of his favourite tunes, Prince’s ‚Sign of the Times‘ and read the lyrics off the back of the album, changing the odd word, and I built a quick bass pulse with some fx. That was that. It didn’t take long. How did the album „Memories of the Future“ come about and did you start working on the album with a certain concept in mind? We’re just trying to keep ourselves interested, thats all. We’ve just been tweaking our sound since the label started, working from the bottom up and gradually adding colour. There was no real concept in mind for us. Its always a bit random, and its the tone of Spaceape’s voice that tends to form the consistent thread through the tracks rather than some overarching sonic concept. We make quite a range of tunes, some without beats, some with, so in a way doing an album is a good format for us. Some writers describe dubstep as being distinctively influenced by and closely connected to its place of origin (i.e. London). Would you say that your music is influenced by your physical and cultural surroundings as well – and if so, how? While a lot of what has been said about grime and dubstep being influenced by its place of origin is real, i think that it can also become a tedious cliche which says as much about the poverty of imagination of journalists and producers as it does the relationship of certain music to their urban environment. We’re not really interested in music that merely reflects an urban environment. I don’t think any music simply does this. The minute you make a noise you’re changing your environment. So for us its more about transforming your environment than reflecting it – bringing out that which is alien in your environment. We are influenced by the quantum diaspora. Futuristic ideas – both utopian and dystopian – have been an important aspect of electronic music since its beginnings. „Memories of the Future“ draws a rather dystopian and dark image of the „future“ which already „infects the real present“ (as the press release states). Where does this uneasiness come from? The uneasiness comes from the nervous state of the world. Reality has collided with science fiction. The future has collapsed in on the present. For us, thats what the feeling of dread in our music is about, the ominous anticipation of the future in the present. Could you explain what Spaceape means by „audio-fiction“? In terms of music, the past is present on the the album to a similar extent as the future, as there are lots of traces and samples of different genres. Could that mean that the „memories of the future“ are somehow „echoes of the past“? We’re more interested in the way that what is happening in the present is both an echo of events that have happened in the past, and an echo of events that are yet to come, events in the future. Thats the kind of temporality we are interested, time scrambling, time loops which lay outside of chronology. The co-existence of the future and the past in the present. Thats why films like Chris Marker’s „La Jetée“ are so powerful and influential. We’re also interested in how futurisms pass like fashions. Our album cover image, its ambiguous building/spaceship thing, is now like an old fashion vision of the future, it kind of looks old fashioned. Each period has its own retro-futurism in visual and music culture. The future is not what it used to be. 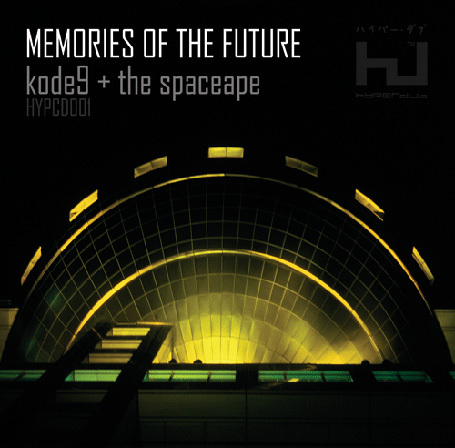 „Memories of the Future“ has been released on Hyperdub Recordings. For more words and thoughts from the Kode head over to the Red Bull Music Academy for an entertaining video lecture (part 1, part 2) or visit „Fact Magazine“ for an interview by Mr. K-Punk. Parts of this interview have been used for a feature article on Kode9 + the Spaceape in the current issue of „Groove“ magazine. Great read! I love the meaning behind the album cover.